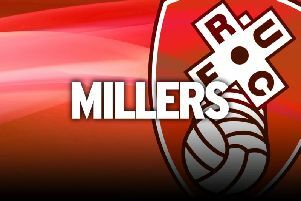 Rotherham midfielder Matty Palmer remains in boss Paul Warne's plans despite his lack of action recently. Palmer has not featured for the Millers since the defeat at Birmingham ahead of the last international break and has fallen behind Will Vaulks, Richie Towell, Ryan Manning and Ben Wiles in the pecking order. The 23-year-old was brought to the club for a substantial fee in January and helped secure League One promotion. He began the campaign in the side next to Vaulks in the middle of the park, but the last month has passed him by as Warne's men have posted a four-game unbeaten run. “I really like Matty and what we brought him in for, it worked,” Warne told the Star. “He came in in January and after he got into the team he was a big part of us going up, he helped us collect a lot of points. “This year he hasn't had as much game-time, but in fairness our two best performances at home he played in both. Palmer's plight was highlighted during the 0-0 draw at Middlesbrough last month when Warne opted to put youngster Wiles on as a second-half substitute ahead of him. The manager insists the two are not like-for-like, though, and backed Palmer to claim the shirt if he gets a chance. “The Middlesbrough game I put Wilesy on because he is the most athletic,” Warne explained. “He does get around the pitch and I think he is going to have a great career. If he didn't have such great players in front of him I would have no shame in playing him every week. “If it was a game where we were 1-0 up and we needed control of the ball and tempo I would have put Matty on, it was just the fact that I don't compare them like-for-like, they are different players for different situations. Palmer will hope to be involved as the Millers head to Blackburn on Saturday, looking to build on their first two away draws of the campaign – at Boro and Preston.